The strategic plan provided both the PHL and the RPWRHS with a better idea of the Society’s immediate needs. It also helped PHL students understand how the Society and its committees worked to meet organizational goals. With this knowledge, after two months of serving on the Board of Directors, Katie, Dan, and I, along with Board member Dona Vitale (not part of PHL), noticed that the Society might operate more efficiently if we redefined some of its committees. Specifically, we wanted to take educational programs out of the events committee, which also handles fundraisers, and put them under the purview of a new education committee. We brought our concerns to the rest of the Board and the Board asked us to explore the issue further and report back to the group. Over the next month, the subcommittee found that it could not address the education committee issue without also considering how the entire organization communicated internally. Without an Executive Director or full-time administrative staff, the Society’s committees struggled to talk to each other. Chronic problems included committees duplicating the efforts of other committees, a lack of clarity about committee responsibilities, and some important areas abandoned completely. Our subcommittee brainstormed possible solutions and developed an organization-wide committee restructuring plan. The plan we drafted provides a structured way for the Society’s committees to converse with one another and with the Executive Committee, reorganizes committee responsibilities so that logical tasks are grouped together, and makes sure that all tasks, even the less popular ones, live within a committee and aren’t forgotten. We presented it to the Executive Committee and, after multiple emails and a meeting to discuss and tweak it; the Board passed it at the end of July. We met once more in August to make sure that everyone understood the plan, and it has been in effect since. Visualization of the restructuring plan. Author’s image. The restructuring plan, in its final form, works by dividing the Society’s operations into five major areas: governance, education, outreach, fundraising, and media. Everything that the RPWRHS does – membership, collections, fundraisers, finance, the website, exhibits, public relations, publications, etc.– falls into one of these areas. These five major areas are now the Society’s official committees, taking over any and all committees that existed prior to the plan. 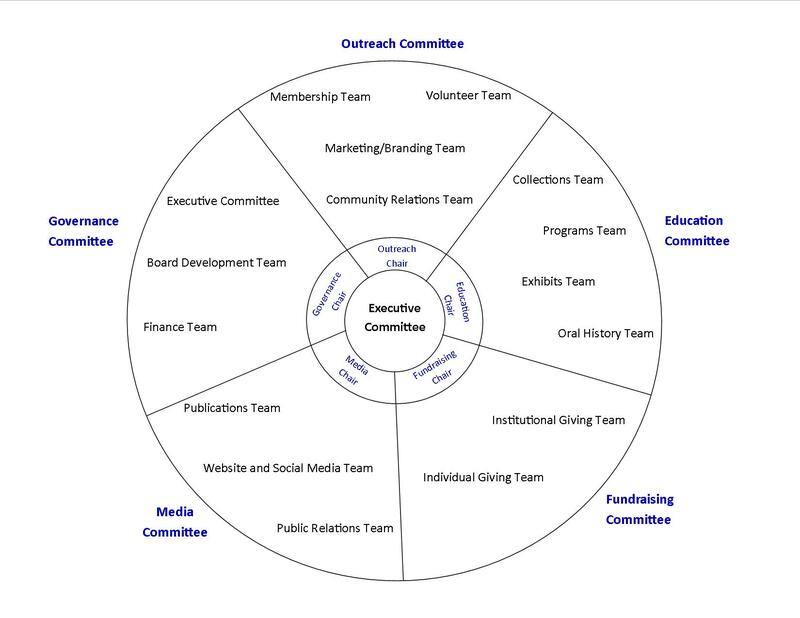 Each committee has a chair that is appointed by the Society president, who is also the chair of the Governance Committee, and the responsibilities of each committee and team are clearly defined in a separate document provided to each RPWRHS Board member and volunteer. Many of the groups that we used to call committees – membership, collections, finance, oral history, etc. – are now called teams. Each of the five committees has several teams within it, and each team has a team leader. Committee chairs must belong to the Board of Directors, but team leaders do not need to sit on the Board. In practice, teams and committees meet as needed and follow the team and committee responsibilities document, and each team leader checks in with her or his committee chair as new developments arise. The chairs, armed with information from each team, check in with each other and the Executive Committee at meetings held every other month. The chairs keep their team leaders informed about activities going on in other areas of the organization. This ensures that team X, under chairperson A, will know what team Y, under chairperson B, is working on. While the restructuring plan is a practical response to many of the issues that were identified at the strategic planning meeting, it is also a major step forward for the relationship between Public History Lab and the RPWRHS. We worked together to find a solution to some of the Society’s most pressing issues, while simultaneously strengthening our relationship and laying the groundwork for future PHL-RPWRHS projects. Hope, thanks for sharing some of our colleague’s experiences with the Public History Lab. The restructuring plan sounds very ordered and logical. I particularly liked the visual graph. Had there been a template for that graph before your work with the society? Also, the visual graphic made me wonder what the structure of the society was before the PHL students began their collaboration. How many committees were there? What was illogical about their organization? Anyway, not that a specific plan for operation has been put in place, is there also a challenge of motivation and inspiration? What are the challenges moving forward?